f you think it is important to remind your well-wishers, friends and faMily that you have entered into the job hunting market, you should order these 3.5x2 custom graduation announcements magnets 25 Mil square corners. 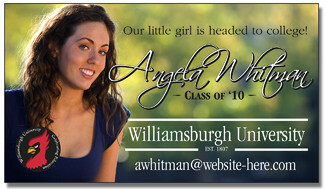 Whether you are graduating from university, school or kindergarten, these personalized announcement magnets are great to spread word about your after event party. You can make an invitation, leave a mark and conquer their memories with these personalized magnets. Order today to get started! Request a quote to know wholesale savings for these 3.5x2 personalized graduation announcements magnets 25 Mil square corners.